Heritage Hall will conduct a free workshop on baking bread in an outdoor stone oven for families with at least one child age 8 or older. The workshop will take place from 9 a.m. to noon Saturday at Heritage Hall, 401 Baldwin Ave. in Paia. Children will have the opportunity to knead dough and shape it into rolls or loaves. They will also learn how to churn butter. Each child will take home a loaf of stone-oven baked bread and some butter. The free workshop is made possible through a community grant from Alexander & Baldwin. Only five families can be accommodated at workshop. To enroll, call 243-0065. The Whaler on Kaanapali Beach invites the community to participate in a beach cleanup beginning at 8 a.m. Saturday. Volunteers may park at the Whaler on Kaanapali Beach, located at 2481 Kaanapali Parkway, and meet at the beachfront Pool Hale adjacent to the pool. 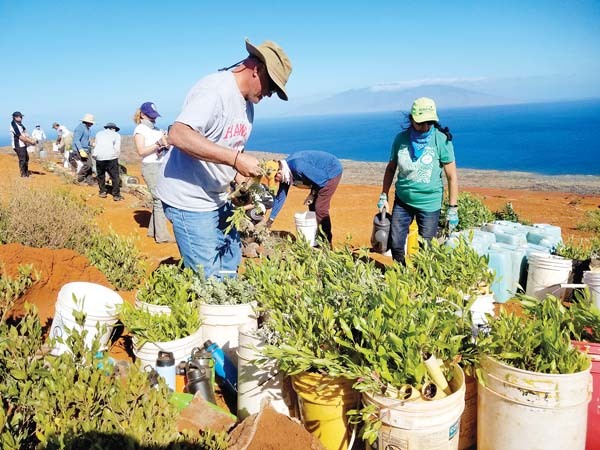 This community service is organized quarterly by The Whaler on Kaanapali Beach. Cleaning supplies and light snacks/beverages will be provided to all volunteers. For more information, call 661-6003. The Maui High School Class of 1968 will celebrate its 50th reunion from 5:30 p.m. to midnight Aug. 18 at La’vas Sports Bar and Grill on Lower Main Street in Wailuku. The cost is $35 per person, which includes dinner, cake and two drinks. Class members my bring a spouse or a guest. The deadline for payment is Aug. 6. For more information, contact Connie Sakamoto Watanabe at 595-7517 or watanabe.c@gmail.com, or contact Calvin Nemoto at 242-4706 or calvin.nemoto@gmail.com. Lena Staton will speak about “Maui Rescue Mission, Helping the Homeless” at the noon meeting of the Rotary Club of Kihei Wailea on Wednesday at Mulligans on the Blue. In May and June, the Venerable Lama Gyaltsen of the Maui Dharma Center and friends made a journey on the pilgrimage path around Mount Kailash in Tibet. Known as the “Center of the Universe,” the mountain’s nearly 22,000-foot summit has never been reached by a human but its 33-mile pilgrimage path beckons the faithful. The Dharma Center will present a slide show and movie of the experience, titled “Journey to the Center of the Universe, Mt. Kailash, Tibet” at 7 p.m. Saturday in the McCoy Studio Theater of the Maui Arts & Cultural Center. The slide show is narrated by Lama Gyaltsen. There will also be a screening of “Kailash — Return to Tibet,” a movie by Emmy-award winning Maui filmmaker Tom Vendetti. Tickets are $30, plus applicable fees, and may be purchased at the MACC Box Office or by visiting mauiarts.org. Tickets are also available at the Maui Dharma Center. The box office can be reached at 242-7469 and the Maui Dharma Center at 579-8076. This event is a benefit the Maui Dharma Center. The Men’s Cancer Support, Advocacy & Educational group has initiated a new interactive support platform for its bimonthly meetings. From 5:30 to 7 p.m. Wednesday, people are welcome to join in by calling (646) 749-3129 and entering the access code: 222-583-973#, #. Instructions for joining via computer or smartphone can be found at pacificcancerfoundation.org, or by phoning Peter Kafka, the moderator, at 298-1655. These live, interactive phone-in meetings are designed to empower men to deal with what can often be a life-changing diagnosis. It is sponsored by the Pacific Cancer Foundation and AnCan.org. The Rotary Club of Kahului will welcome Eva Bondar of the American Heart Association to speak about the association’s “Kids Cook with Heart Program” during the club’s meeting from noon to 1 p.m. Monday at Tante’s Island Cuisine, located at the Maui Seaside Hotel, 100 W. Kaahumanu Ave. in Kahului. Bondar is the new development manager for the Kids Cook with Heart Program Maui. Currently in partnership with Lahaina schools, Bondar is aiming to expand the program’s reach throughout Maui and the state through fundraising and community outreach. The American Heart Association has developed the Kids Cook With Heart program to teach schoolchildren how to embrace a healthier lifestyle. Iao United Church of Christ’s annual bazaar and community event will take place over two days. Events will include a rummage sale from 6 to 8 p.m. Friday and from 8 a.m. to 2 p.m. Saturday. There will also be a plant sale, cultural demonstrations and food booths. The church is located at 2371 W. Vineyard St. in Wailuku. Pacific Cancer Foundation will offer a free beauty workshop to Maui’s cancer community from 8 to 9:30 a.m. Saturday at Sephora, a store located at Whaler’s Village in Kaanapali. Sephora has developed Classes for Confidence to help inspire fearlessness in those facing major life transitions, according to an announcement. Whalers Village is located at 2435 Kaanapali Parkway. Space is limited. To register, call 242-7661 or visit pacificcancerfoundation.org for more information. The Rotary Club of Lahaina Sunset will hold a School Supplies Drive for the children at Hana Elementary School from 9 a.m. to 4 p.m. Aug. 4 at the entrance of the Lahaina Cannery Mall, next to Longs. “We are hoping that our community will continue to help out the children in Hana who often can’t easily acquire their needed school supplies.,” said Joanne Laird, past president of the club.